Live Streaming seems to be new sensation all over the internet. Almost, if not all of the social networking sites now have the live stream or Go Live feature. But one thing that has eluded many users is knowing how to live stream prerecorded video on Facebook. Both on their Facebook profile and Facebook page. Other sites like YouTube, Instagram and Snapchat do not support live streaming a prerecorded video. Even Facebook does not technically support it. You can only achieve this feat with an external app or software. This is because Facebook allows its users to use other software and apps to live stream their video. Although it can not be done through Facebook website, it can be done on those softwares or apps that sends the video stream straight to Facebook to broadcast. So by using other softwares, you can be able to live stream a prerecorded video. Which is one of the numerous reasons people prefer using those softwares to using Facebook website. These softwares include OBS, Livewire, LiveReacting, WireCast and many more. Some of these software are free, while some are not. Nevertheless, they all give somewhat same results. The one we will be using for this tutorial is not free and costs money depending on how many live stream you want to broadcast in a month. Although, OBS is good and free to use but the setup process is quite lengthy and not very easy to comprehend. So we will be using LiveReacting which does most of the heavy lifting for you. ▪ Head On To LiveReacting. Sign In with you Facebook Account and Grant Access to your Facebook profile and pages. ▪ You may or may not be given a free credit to try out the service. If you were not given a free credit, then you might want to buy some. ▪ I would advice going for just 1 credit. You can get 1 credit for free by chatting with their support. It can be something like this: “Hello, I will love to test this service if you can grant me access to a demo”, just to test it out. 1 credit costs about $4 (N1500) and you can pay via PayPal or Credit Card. ▪ After buying or getting the credit(s) needed, go to dashboard and select “post prerecorded video” you will be asked if you want to post the prerecorded video on your Facebook profile or Facebook page. Select your preference and click on Continue. ▪ This is where you select a video to be uploaded and hit Upload Button. This might take a few minutes depending on the size of the video and how fast Your internet connection is. Note: The video should be only in .Mp4 format and any other format will not be accepted. So make sure you convert the video if it is in .avi, .wmv or any other video format that is not .Mp4. This video must also have audio. ▪ Remember to put in a description of the video and also reduce or increase the live stream duration to fit the video uploaded. Lets say the video is 4 minutes 42 seconds, you can set it to 4 minutes 44 seconds. ▪You can now post the video to Facebook Live. The video will live stream seamlessly without any hiccups even if your network is not stable, as the video has already been uploaded to LiveReacting server and is being broadcasted from there. Note: Facebook takes copyright infringement seriously and should you be caught live streaming someone else content like music, music video or any other content that does not belong to you without permission from the owner. You might be banned from live streaming for sometime or indefinitely. There are numerous softwares one can use to live stream pre-recorded video on Facebook but to me, LiveReacting seems like the best and definitely the easiest. The fact that LiveReacting does not need a live stream key makes it even better and definitely worth paying for the service. 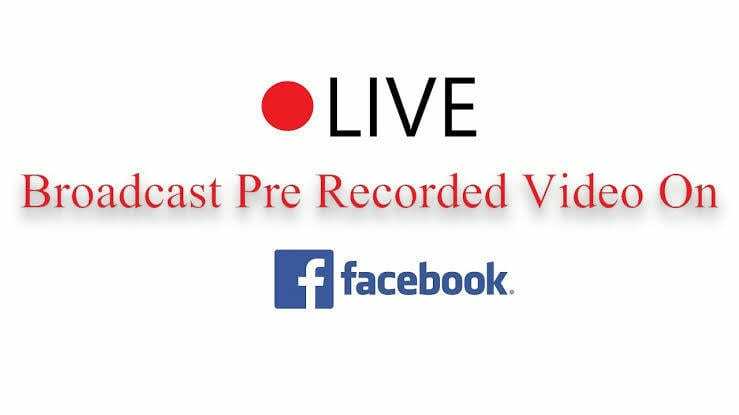 Now that you know how to live stream prerecorded video on Facebook using LiveReacting, let us know if you would be using it in the comment section below.